Reference number for this case: 25-Oct-54-Saint-Quirin. Thank you for including this reference number in any correspondence with me regarding this case. Mr. Louis estimated that the device measured about 6 meters in diameter and 3 meters in height. Its color was orange with many phosphorescent reflections. It was not motionless, it was flying in slow motion, almost level with the ground. Mr. Louis and his brother followed it with the eyes for a few seconds until it disappeared on the horizon towards Bas-Bois. Highly impressed, the two men wanted to get their vehicle back on the road, but the battery was completely empty and they had to use the crank, which they usually did not have to do. Their mother had seen from afar the lights of the tractor go out. Believing in an accident, she came along with a lantern to meet her sons and had also noticed "the phenomenon." In the 1970s, the two "skeptical" authors Gérard Barthel and Jacques Brucker described this case, indicating that they could not join the two witnesses, "for the obvious reason that they were dead". They say that the mayor "of the commune" told them that the two witnesses did not come back from work, but from getting wine at Saint-Quirin, Barthel and Brucker deducing that since one does not buy wine without tasting it, the two witnesses could have been drunk. They add that "it was known" that "the dynamo of their tractor did not load." They add that the mayor explained that when the battery was discharged, "it happened what should happen" and without the intervention of the mayor of the time, the two men would have spent several days in the gendarmerie jail. Barthel and Brucker concluded that "under these conditions", there was no need to invent a flying saucer story to justify the power loss, but that is what the two men had done. They add that they are affirmative that no case of "engine stop caused by a flying saucer has ever occurred in 1954." Lorquin (from our correspondent). -- On can judge of the emotion of Mr. Marc Louis, who lives at the farm of Lhor, at Les Métairies Saint-Quirin (the Moselle), when, on Monday evening, accompanied by his brother Yvon, he found himself stopped by a an object of cylindrical form which caused his engine and light to stop. This apparatus, Mr. Louis estimated that it measured about 6 meters in diameter by 3 in height. It was not stopped and was flying slowly, almost to the ground. Its color was orange with many phosphorescent reflections. Mr. Louis and his brother followed it with their eyes for a few seconds until it disappeared on the horizon towards the Bas-Bois. Strongly impressed, the two men wanted to restart their vehicle, but the battery was completely discharged and they had to use the crank, which they usually never do. Their mother, who from a distance had seen the tractor lights go out, thought of an accident, and came with a lantern to meet her children. She also noticed the phenomenon. The author indicates that on October 25, 1954, in the Moselle, "Mr. Louis. Tractor. Saucer almost at ground level. Tractor stopped. (Regional newspaper in Garreau file). Oct. 26, 1954, 08:30 P.M., Les Metairies (France). Approximate date. At this place situated near Saint Quirin, Mrs. Louis and her sons Marc and Yvon observed an orange craft, 6 m diameter and 3 m high, fly over them as their tractor engine died. The lights also went out, and the battery was found dead after the sighting. (Personal). At this place situated near Saint Quirin, Mrs. Louis and her sons Marc and Yvon observed an orange craft, 6 m diameter and 3 m high, fly over them as their tractor engine died. The lights also went out, and the battery was found dead after the sighting. (Personal). Notes: 1) The date is not approximate, the primary sources does say "Monday evening"; 2) Vallée gives a precise hour when there isn't one, it can only be assumed it was on the evening since the witnesses have headlights on; 3) The object did not "fly over them"; 4) The "personal" source only means Vallée had some source in his personal papers. Jacques Vallée indicates that 6 days after the "Shoubrenner" sighting, in the dense woods of Alsace, near Saint Quirin, a tractor was stopped as an object flew over at low altitude. The two authors indicate that in Saint-Quirin in the Moselle, on October 25, 1954, at 08:30 p.m., two brothers were returning from work when they found themselves in the presence of a three height meters luminous cylindrical machine of six of diameters, of orange color with many phosphorescent reflections. The engine of their tractor stalled. The two farmers looked at this object during several second, and it disappeared in the direction of "Bas-Bois." The authors note that the battery of the tractor was found completely discharged and that the farmers had to start again the tractor with the crank, something which had never happened to them before. "Mr. Marc Louis and his brother, farmers, were returning from their work when they came in the the presence of a luminous phenomenon of cylindrical shape, which turned off the engine of the tractor. This strange object was approximately six meters in diameter, three meters of height and flew slowly at ground level. Its color was orange with many phosphorescent reflections." "During a few seconds, the two men followed it with the eyes to see it disappearing in direction of the "low wood." "The battery of the tractor was completely emptied and they were obliged to use the crank to restart the engine, something they never had to do." The two authors indicate that whereas they failed to contact the two witnesses, "for the obvious reason that they had deceased" but the mayor "of the communnity" - the said community is not specified by the authors - told them that the two witnesses were not returning from their work but were returning from buying wine in Saint-Quirin; the authors reasoning that one does not buy wine without tasting it the two witnesses could thus have been drunk. They add that it "was known" that "the dynamo of their tractor did not charge." They add that the mayor explained to them that when the battery was emptied, "it occurred what was to occur" and that without the intervention of the mayor of that time, the two men would have spent several days in the gendarmerie's jail. The authors conclude that under these conditions, it was by no means necessary to invent a flying saucer story to justify the empty battery, but that it is what both men had done. The authors add that they are certain that there was not one case of motor stall caused by a flying saucer in 1954. In an extract of his Francat catalogue, Michel Figuet recorded that the CE0-2 case in Saint-Quirin was a hoax by the two witnesses who were drunk. A Mme. Louis and her sons, Marc and Yvon, were working their farm late in the day on October 25th. They were using a tractor. Because of the increasing darkness the farm machine's headlights were on. According to these farm folk an orange-colored body the size of an auto suddenly streaked overhead. At the same time the tractor stopped running and its headlights went out. Afterwards, while trying to restart the tractor, the boys found that the battery was fully discharged. 205. 205. Rogerson, Peter. "The Catalogue." MUFOB New Series 4. Autumn 1976. #38. p.7. 1954 - Late in the day at Les Metairies, situated near Saint Quirin, Meurthe-et-Moselle, France, Mrs. Louis and her sons Marc and Yvon observed a six-meter diameter orange craft that flew over them as their tractor engine died. The headlights on the tractor also went out, and the battery was found to be dead after the sighting. (Sources: Jacques Vallee, Passport to Magonia: A Century of Landings, p. 239, case 312; Mark Rodeghier, UFO Reports Involving Vehicle Interference, p. 4). 08:30 p.m. At Les Métairies (France), in this place, located close to Saint-Quirin, Mrs. Louis and his sons, Marc and Yvon, observe an orange machine 6 m in diameter and 3 m in height which passes above them. At the same time the engine of the tractor stalls. The lights also die out and the battery is found discharged after the observation. Jérôme Beau published the Mark Rodeghier [mr1] text in English. Luc Chastan indicates that in St Quirin, the Moselle, October 25, 1954 at 20:30 hours, "Two brothers return from their work, when they are in the presence of a three meters high luminous cylindrical object six meters in diameters, of orange color with many phosphorescent reflections. The engine of their tractor stalls. The two farmers follow with their eyes during several second this object which disapears in the direction of the "Bas-Bois". It should be noted that the battery of the tractor was completely discharged and one needed a crank to start it again, something that had never happened." 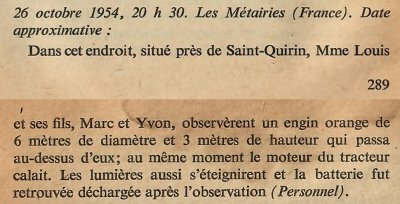 The website indicates that on 26 October 1954 at 20:30 in "Les Metaires", France, "Woman and two sons observe orange craft, 6m diameter, fly over as tractor headlights and engine died. Batttery was dead after encounter." And: "An object was observed. Electromagnetic effects were noted. One orange disc, about 20 feet across, was observed by three witnesses (Louis)." The sources are indicated as Bowen, Charles, The Humanoids: FSR Special Edition No. 1, FSR, London, 1966; Vallee, Jacques, A Century of Landings (N = 923), (in JVallee04), Chicago, 1969; Schoenherr, Luis, Computerized Catalog (N = 3173); Rodeghier, Mark, UFO Reports Involving Vehicle Interference, CUFOS, Chicago, 1981; Falla, Geoffrey, Vehicle Interference Project, BUFORA, London, 1979. The website indicates that on 26 October 1954 at 20:30 in Les Metairies, France, "An orange craft, six meters diameter and three meters high" and: "Late in the day at Les Metairies, situated near Saint Quirin, France , Mrs. Louis and her sons Marc and Yvon observed a six-meter diameter orange craft that flew over them as their tractor engine died. The headlights on the tractor also went out, and the battery was found to be dead after the sighting." And: "Approximate date. At this place situated near Saint Quirin, Mrs. Louis and her sons Marc and Yvon observed an orange craft, six meters diameter and three meters high, fly over them as their tractor engine died. The lights also went out, and the battery was found dead after the sighting." *Oct. 26, 1954 - Late in the day at Les Metairies, situated near Saint Quirin, Meurthe-et-Moselle, France, Mrs. Louis and her sons Marc and Yvon observed a six-meter diameter orange craft that flew over them as their tractor engine died. The headlights on the tractor also went out, and the battery was found to be dead after the sighting. (Sources: Jacques Vallee, Passport to Magonia: A Century of Landings, p. 239, case 312; Mark Rodeghier, UFO Reports Involving Vehicle Interference, p. 4). Mrs Louis and sons, Marc and Yvon, observed an orange object 6m diameter, 3m high fly over them as their tractor engine failed. The lights also went out and the battery was found dead after the sighting. What a mess! As often with Barthel and Brucker, the "explanations" they give are so confusing that one can really wonder what they are worth. However, there are cases where their laborious and imprecise explanations were nevertheless correct (see for example the case in Bélesta). Here, there is firstly the deduction that since they had bought wine, they could have been drunk. It is possible, but on the one hand it is just a guess, on the other hand, we can assume the drunkenness of any witness even if he has not just bought wine, and finally, contrary to a tenacious legend, being drunk does not produce flying saucers, unless you are in a state of delirium tremens, an extreme state in which it is then hardly possible to begin to start a vehicle with the crank; not to mention that the alcoholic "vision" is unlikely to be the same for three people with only two of them drunk. Even worse, the "craft" seems to have been seen only a few seconds, it is "cylindrical", "orange with many phosphorescent reflections", it "disappears" behind the horizon; so it could have been a meteor, quite simply. The case therefore remains for me an "unidentified" of low quality, low strangeness, which may have been a meteor observation, or, perhaps, an invention. [er1] Article in the regional newspaper L'Est Républicain, France, page 6, October 27, 1954. [---] Article in the regional newspaper Les Dernières Nouvelles d'Alsace, France, Mulhouse - Strasbourg, October 27, 1954. [jv3] "Chronique des Apparitions Extra-Terrestres", French translation of "Passport to Magonia", book by Jacques Vallée, Denoel publisher, France, pp 289-290, 1972. [jv2] "Le Modèle Derrière les Atterrissages d'OVNIS - Rapport sur l'Analyse de 200 Observations Documentées Faites en 1954", by Jacques Vallée, , "En Quête des Humanoïdes", book by Charles Bowen, French translation of "The Humanoids", J'ai Lu publisher, page 42, 1974. [fr1] "OVNI, Premier Dossier Complet des Rencontres Rapprochées en France", book by Michel Figuet and Jean Louis Ruchon, Alain Lefeuvre publisher, France, pp 198-199, 1979. [bb1] "La Grande Peur Martienne", book by Gerard Barthel and Jacques Brucker, Les Nouvelles Editions Rationalistes éditeurs, page 189, 1979. [mf1] "Catalogue Francat des Rencontres Rapprochées en France - Listing 800 - 1982 - 6 - Suite et Fin", listing par Michel Figuet, dans le magazine d'ufologie Lumières Dans La Nuit (LDLN), France, #265-266, page 17, July/August 1986. 1.0 Patrick Gross February 20, 2010 Conversion from HTML to XHTML Strict. First formal version. Additions [mc1], [jb1], [ud1], [ud2]. 1.2 Patrick Gross December 6, 2016 Additions [er1], [ub1]. 1.3 Patrick Gross December 14, 2016 Addition [lg1]. 1.4 Patrick Gross January 26, 2017 Addition [ac1]. 1.5 Patrick Gross Fabruary 11, 2017 Additions [bl1]. 1.6 Patrick Gross December 18, 2018 Additions [pr1], [lh1], [pr2], Summary. Explanations changed, were "Not looked for yet." This page was last updated on December 18, 2018.